Two techniques that will help you get better pictures of airborne aircraft are ‘panning’ and ‘follow-focusing’. With panning, you move the camera with the subject while keeping it in the viewfinder. Make sure you have a firm stance or are seated. Pivot from the waist, not the neck, in a fluid motion. Continue panning with the subject for a second or two after you have released the shutter button. This will eliminate any camera shake caused by abruptly stopping your pan when you press the shutter. With follow-focusing, it is just as the term implies; you follow the subject while continually focusing on it. Many of you have purchased auto-focus cameras so you would not have to focus yourself. That’s what you ‘bought the camera to do’. Well, in many cases an auto-focus does get the job done. However, auto-focus has an annoying tendency to ‘hunt’ for the subject before it ‘locks on’ if there is too much sky in the background. It may cause you to miss some great action shots. It is recommended that you select manual focus on the camera. Panning and follow-focusing techniques take time to develop. A great place to practice them is at your local airport. But you don’t even have to go that far. You can practice this on cars driving down the street. Make sure you are in a safe area when you do this, such as on a sidewalk. It helps to know your subject. Pick out identifying characteristics and highlight them. For example, the unconventional angular shape of the F-117 Nighthawk, the Stealth Fighter. Try to get a photo that shows its odd shape. Or the AV-8B Harrier, the jet that can hover like a helicopter. Get shots that show it in hover, or shots on the ground that shows the engine and nozzle arrangements that allow it to hover. 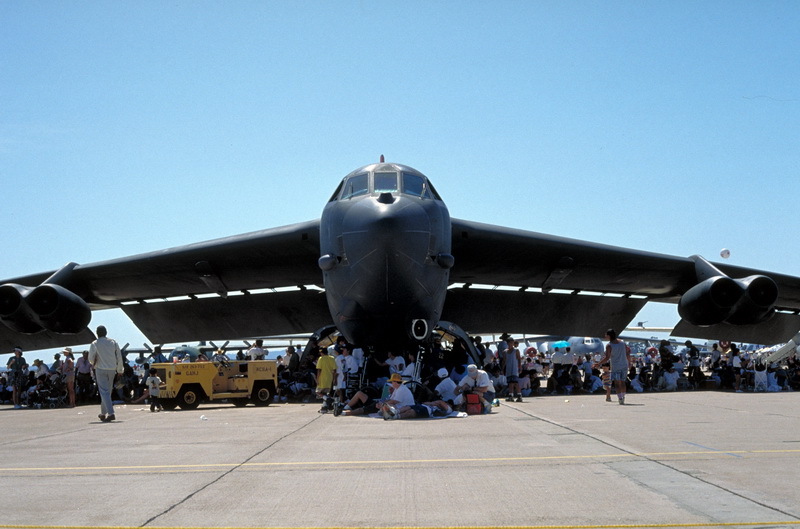 The B-52 has an enormous wingspan. The photo you see here shows another use for those massive wings. Any photograph of a jet in full afterburner is always, well, hot! Knowing your subject can help you anticipate the peak of the action and be ready for it when it happens! Fill the frame with your subject. If that is not possible, try to include interesting and/or related background. Be aware of other things in your shot such as light poles, telephone lines, etc. If you are working with a shorter telephoto lens, you can still fill the frame with the aerial demonstration team formations, i.e. 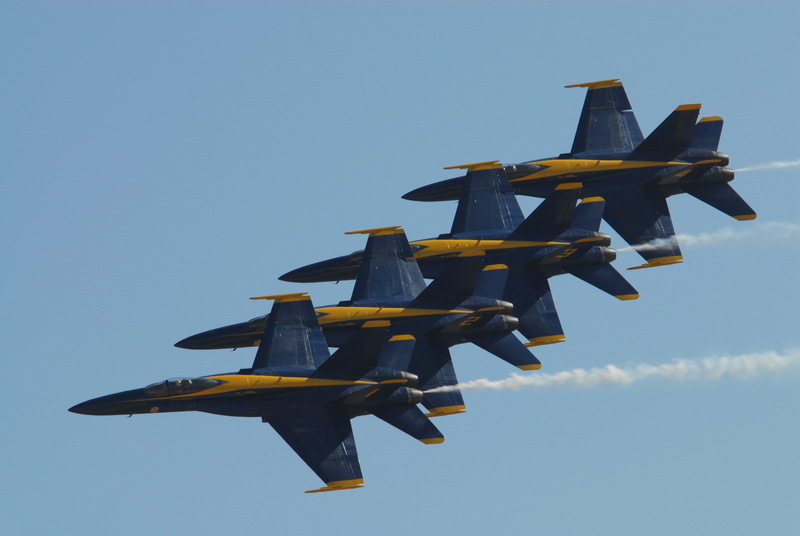 the Thunderbirds or Blue Angels, if the single aircraft are too small. If you are using automatic exposure, be aware of sun’s location in the sky. It could render your very colorful aircraft down to a dark silhouette. A very bright sky has the same effect. Walk around the airplane to find a better angle. If the aircraft is flying, wait until it moves to another part of the sky. For the most part, setting the exposure manually can minimize this problem. A trick is to take a light reading with your camera off a pair of dark blue jeans (dark blue, not the lighter stone washed variety) if it is a sunny day. Set your camera according to the reading. Another thing to be aware of is shadows on the ground, especially your own. Wide-angles are great for getting close enough to the aircraft to eliminate people from your picture and still get the entire plane in the frame. However, if you are not careful, a wide-angle lens can seriously distort the plane. Experiment. Some of these distortions may turn out to be very appealing. Good luck with these aviation photography secrets. You are now on your way to shooting like the pros! Click the Aviation link on my website to see some of the photographs I made using these tips. Whenever I’m out shooting aviation-related subjects, I put the inside information you are about to read into practice. Click the Aviation link on my websiteto see the fruits of my labors. If you are into aviation photography, you might find these tips I put together useful. I wrote this several years ago but the information is still relevant. After applying these helpful hints on your next trip to photograph airplanes, you should come back with improved results. Happy shooting! Local small airports, airfields, or flying clubs are good places to get started. It is easier to gain access to the fields. Develop good relationships with some of the owners, pilots, etc. Offer to help with some of the routine tasks such as refueling, cleaning aircraft, and clearing the runways of foreign object debris, or FOD as it called. Take some photos of the pilots with their planes. They put a lot of time and effort into maintaining their planes so they are usually more than happy to oblige someone who has taken an interest. Give them an 8×10 copy of the results or send them an e-mail with the photo attached. By now, folks around the airfield should know you and may even offer to take you up when they go flying! Be advised that security rules vary by location and it may not always be possible to gain such access. Airparks and museums are great places to get shots of static aircraft. You can get almost close enough to touch some. Others you actually get to go aboard. The crowds at museums and airparks are much smaller than those at air shows so you can take your time with the photographs you are making. Airports are another place to get good aircraft photos. Though you will not be able to get out onto the field, there are usually good vantage points on roads alongside the airport from which to photograph. If you like military aircraft, the best place to find them is at the air show. Here you will find military aircraft you may not get a chance to see anywhere else. You will also see many of them demonstrated. Air shows offer many different types of aircraft together in one place. Some aviation enthusiasts liken air shows to being a kid in a candy store. Warning! Many aircraft can be loud, especially the jets, and especially at air shows. Ear protection is highly recommended. If you are using a point-and-shoot or a single-use camera, you can use it for static aircraft. However, single-use and point-and-shoots do not work well for aircraft that are airborne because their lenses are not sufficient for that type of work. You can try to take the picture, but the outcome will be a lot of sky with a very little airplane. If you are using an SLR, you will need more than one lens. To get the static planes, a wide-angle such as 28mm, 35mm or a zoom incorporating a range from 28mm to 85mm or 135mm works well. To get the planes in the air you will need a telephoto or super-telephoto lens. For this type of shooting you must have at least a 200mm lens. If you can afford it, a 400mm or 500mm lens is excellent. A 600mm lens would be a dream. A zoom lens should begin at at least 100mm and go to 300mm or 400mm. Zoom lenses have one advantage over fixed lenses in that they are able to fill the camera’s viewing area with a single small airplane or all nine jets of the Snowbirds jet team without changing lenses. Where fixed lenses have the advantage is in something called lens speed. With fixed lenses you are able to shoot in slightly darker situations and at higher shutter speeds than with zoom lenses. And it is easier to focus with these faster lenses. Which set-up is best? It depends on your personal tastes and budget. In most cases, 100 ISO film works best. Whether you use color print or color slide film is up to you. Note that it is much easier and cheaper to make enlargements from print film. If the day is cloudy or overcast, you may use 200 ISO. Anything higher than that will result in grainy pictures if you have them enlarged beyond 8×10. 400 ISO is stretching the boundaries but today’s films make it possible. There are situations, such as night shows, where you must use higher film speeds such as 400 or 800 ISO. Make sure you have a full roll of film loaded in your camera before your favorite performer takes to the air. There’s nothing worse than realizing you’ve just clicked the last frame on the roll and the performer still has half the show left to do. “”Excuse me, Thunderbird leader. Could you do the five-card again? I was changing rolls and missed it.” Needless to say, be sure you have brought along enough film for the day.